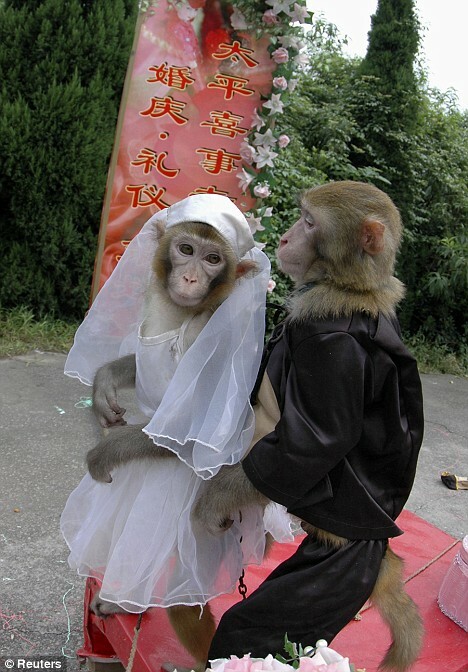 Maybe the dress wasn’t the right size, or perhaps it was the grey and gloomy weather – but these two monkeys don’t seem over-the-moon after being married in China. The downcast-looking pair tied the knot in a special wedding ceremony at their zoo. 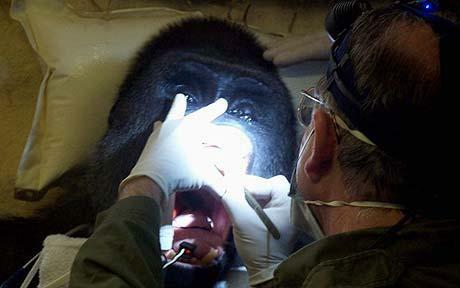 Punkeys get better dental care than we do! This 28 st primate had to be sedated for two hours by specialist vet dentists during a successful operation to remove a painful three inch root. Pertinax, a silverback Western gorilla, was said to be “understandably groggy” after the operation at Paignton Zoo in Devon. 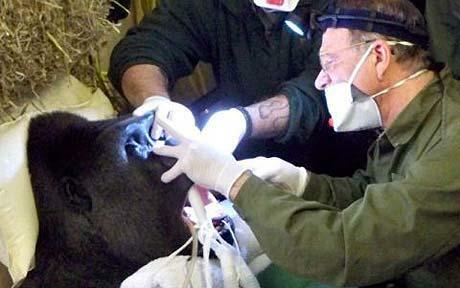 He was treated by Dr Peter Kertesz, one of only a few specialist zoo dentists in the world, who has worked on exotic species including whales, pandas and elephants. He said: “Animals or people, it’s all the same – they need treatment, they get treatment. The scale is what varies – and the location. It is all about teamwork. Pertinax is the 25-year-old leader of the zoo’s bachelor group of gorillas and was treated at the attraction. Dr Kertesz has a dental practice in London and his first experience of animal dentistry was when he looked at a cat for a vet in 1978. Marvel Sells Out to the Punkey Agenda!! King Kong. Curious George. Clint Eastwood’s buddy in Every Which Way but Loose. All pioneering simians, all troublemakers. Come Sept. 3, Spider-Man, Wolverine, Daredevil, and their compadres will join these ranks when Marvel Comics, in a bid to duplicate the success of the Marvel Zombies franchise, re-envisions its marquee superhumans as…apes. Creepy apes. It begins when Marty ”The Gibbon” Blank, a mutant chump with chimp-like powers, is ensnared in a science experiment gone wrong. He’s jettisoned into a sinister alternate reality devoid of humans; here, all of our crime-fighters are now hirsute anthropoids. Joined by the fetching human scientist Dr. Fiona Fitzhugh, this wannabe villain (the Gibbon founded the Spider-Man hating/baiting Legion of Losers) is, in fact, recruited by the seemingly upright Ape-Vengers as he searches for a way back home. As writer Karl Kesel (Fantastic Four) said in an interview at New York Comic Con earlier this year, this is ”a sprawling epic like Lord of the Rings, and the Gibbon is our Frodo — one small person dwarfed by the overwhelming forces….” But who are we kidding? At heart, Marvel Apes — with illustrations by Ramon Bachs (World War Hulk: Frontline) — is a four-issue miniseries about spandex-clad paladins acting uncivilized because they’re apes. The discovery of a previously unknown gorilla population in the vast forests of northern Congo brings the total number of animals to a mammoth 125,000 – double that of previous estimates – and should make even the most pessimistic conservation biologist smile. Hey mom! We’re taking over the world! !